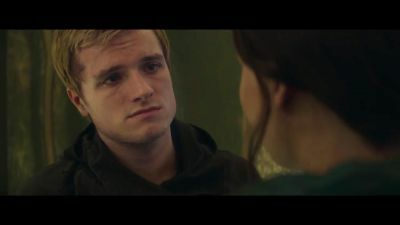 TTE: Speaking of poor… can we talk about Peeta’s face? JJ: No, it hurts me too much. TGWTP: That one Peeta shot of them hugging is so poignant! The Katniss/Peeta heartfelt hug is actually a continuity bit at this point. No matter what they go through and how upset they are– At one point, they will hug it out. TTE: Hey, we like continuity! JJ: I’m so happy they aren’t playing the “Will Peeta recover or not?” card. In the book, you figure he’ll recover somewhat. So what’s the point of drawing that out in the trailers. WE KNOW. GIVE US SOMETHING NICE. TTE: But he still looks broken. TGWTP: That’s the second half of the film and he’s clearly still devastated, but I’m glad the trailer isn’t playing up the angle that Peeta could lose it at any second. He’s broken, but they’ve avoided making him look like a potential maniac. I approve! JJ: True, he’s not old Peeta. But he’s not in strangle mode there. They could have chosen to show that. But not necessary, since it’s where we left off. TGWTP: Fans have made to very clear that they don’t like Peeta being represented poorly. They avoided that with style! 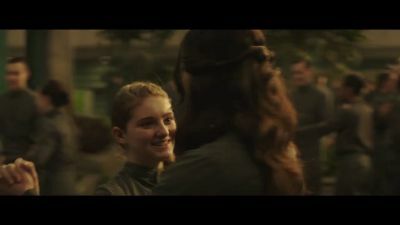 TGWTP: And speaking of hugs, Katniss and Prim dancing, anyone? JJ: So sweet. Got to build that relationship up more, so it can be even more devastating later. TTE: Yes, that hug was somewhat more heartbreaking, because we know the outcome of the story. TGWTP: They need to play up Katniss and Prim. It’s not that their relationship isn’t believable, but audiences have to really CARE about it to make Prim’s ending effective. JJ: It’s critical that they do that. I think they’ve done a decent job with the last 2 movies of building it up more than the books. So it’s looking good. TTE: Exactly, because even as book readers we’re all a little bit “meh” about Prim even at this point in the franchise. Sure Willow’s great, but character development has been lacking, and I kind of blame the book for that. TGWTP: I’m with you there. Prim was kind of held on a distant pedestal in the books and I think that’s tough to translate. TTE: She’s just the stoic girl in the background, holding a cat. TGWTP: Here was a big surprise for me. 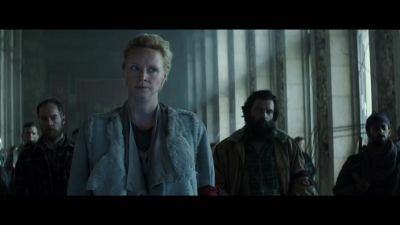 Were you guys actually expecting to see Katniss in full Mockingjay uniform, walking up to execute President Snow? They don’t show Snow, obviously, but WE KNOW WHAT’S GOING DOWN. JJ: Yes, I think I imagined it that way. Well, not in such grand scale with her walking down with the people behind her, but Mockingjay suit, yes. TTE: I did not imagine that way! It’s been so long though, I can’t fully recall what I did imagine. JJ: OHHHH, Yes, I was surprised at how much they showed from the end of the film! I was thinking they’d stick to the first half. TGWTP: Yeah! I didn’t think we’d get this definitive picture of the nation rallying around Katniss. JJ: Last half has some pretty dramatic fodder, but yeah… I expected more from the D2, perhaps even playing up the Gale/ Katniss angle. TGWTP: There’s NO Katniss/Gale here and I am so very happy about that. Leave that love triangle shizznit at the door! JJ: Done with it. Hopefully the movie tones it down too. TTE: It’s pretty clear that her feelings lie more with Peeta at this point, anyone who’s still on the “oh, well… what about Gale?” front… seriously? TGWTP: The crazies, that’s who! THE WALLS, MAN! THE WALLS! 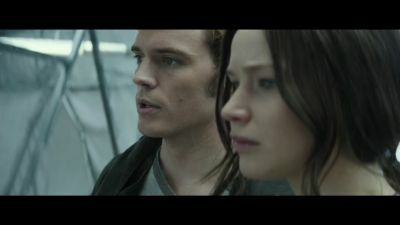 JJ: Did you notice that scene that looks like it’s with her and Haymitch… but it’s not. It seems to be from her return to District 12. TGWTP: JJ, were you referencing our one shot on Haymitch in this trailer? JJ: Well, the shot of Katniss right before. She’s wearing casual clothes and the wall looks like her VV house. Seems like way end of the book stuff. TTE: I thought that was in the Capitol! TGWTP: I think it might be in Snow’s mansion. 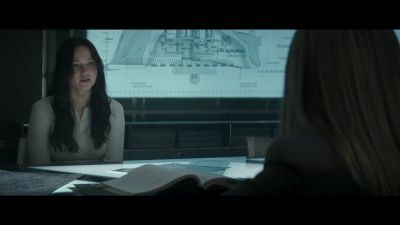 Most of that assumption is because of the fancy lighting behind Haymitch! JJ: I don’t know… the walls man, the WALLS. Just in the shot of Katniss. 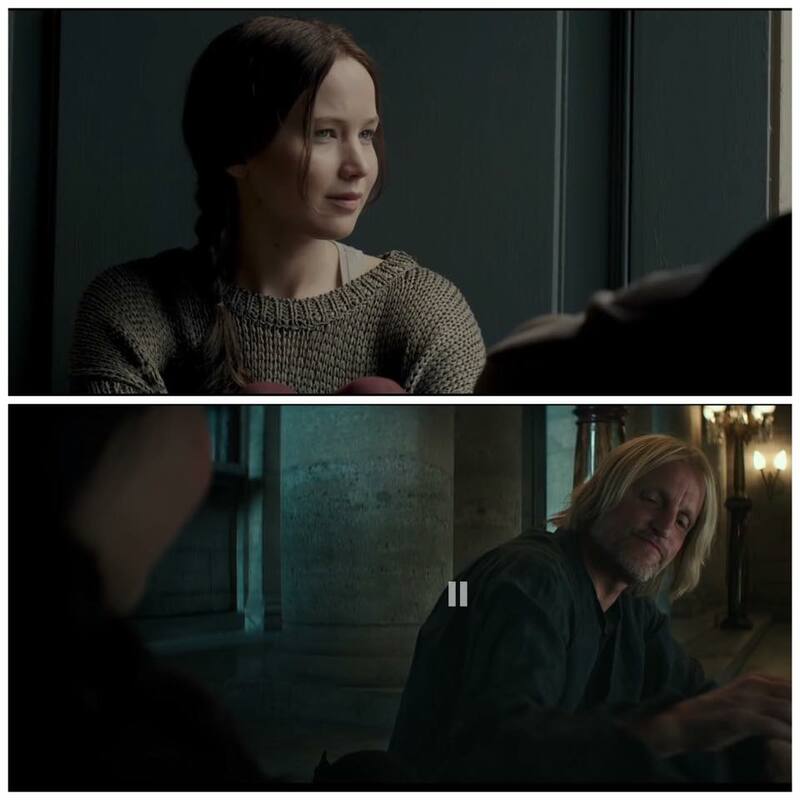 The Haymitch shot is clearly from another scene. JJ: They’re clearly from different scenes. That much I feel confident about! Sneaky trailer editors! TTE: No, there are marble pillars, and electric standing candelabaras, that’s the presidential mansion. JJ: Yes, the Haymitch scene. 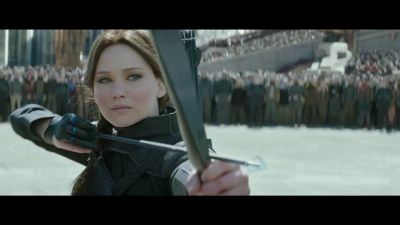 But look at just the Katniss shot. Different! DOWN WITH THE CAPITOL! …BUT PLEASE SAVE THE PRETTY BUILDINGS! TGWTP: When we saw all those paparazzi photos from Noisy Le Grand, what did you actually think was happening? Because I did NOT predict running from a giant tar flood. JJ: I didn’t think it was the tar either. But makes sense now with all that frantic running! I think there’s still some CGI work to do on that tar scene though. At least I hope. TTE: Yeah, I’m sure the FX crew are working day and night on it. Probably the same team that did the water in CF. TTE: All I know is, I was not expecting that gorgeous apartment complex to be shattered! I saw the Google images of that apartment complex, it’s 360 degrees, and it’s amazing. I thought they’d leave it in tact. TGWTP: But it’s the Capitol! DOWN WITH THE CAPITOL! TTE: Ha, sucker for cool architecture. And it’s some real architecture, not something conjured up by the production crew. TGWTP: So what was your favorite quote in the trailer? Because there’s SO MANY good ones! JJ: Last line… definitely. Love those book quotes. TGWTP: Sam delivered that perfectly. It could have been really tacky and gratuitous. JJ: And for all the doubters after Part 1 who were like WHERE’S THE HUNGER GAMES?? Well, here it is, you sickos. JJ: LOL, suddenly this post is gonna get more hits. TGWTP: Any last thoughts we wanna add about the trailer? JJ: Well, we get a second of Lyme. She’s just standing there, but I’m glad they included her. TGWTP: It’s amazing what a great actress can convey in like half a second! TTE: Her costume is cool too. JJ: Looking forward to seeing her in that role. Yay, new characters! TGWTP: I feel like that was put in so GoT fans had a recognizable face, but I don’t mind! TTE: Hey, in that case they should have put more of BLANKING ON HER NAME…. SIDE CUT LADY, THE QUEEN. TGWTP: Nope. “Side cut lady” is her name now. TTE: My friend just got a Cressida hair cut, by the way. JJ: I’m sure Natalie Dormer would appreciate you thinking of her that way. THE QUEEN. TGWTP: Oh lord. This took a sharp left turn. TTE: I like left turns! I have to agree with jj. 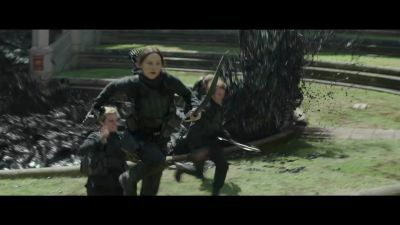 The shot of katniss is definitely from a different scene. Also f you listen really closely to that monent of the trailer you can hear birds chirping. The lack of burn scars on Katniss is worrying me unless they CGI’d them out. Well Katniss doesn’t have much for facial burns and everything else is covered by the suit. She’s also been dolled up with tons of make-up by the D13 prep team in the scene. It’s possible they’ll CGI IN some scarring, but it would be minimal. 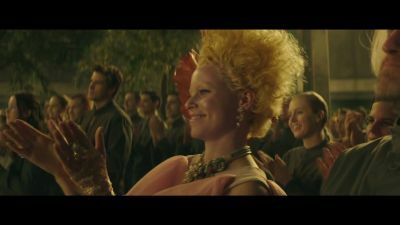 And yeah, there’s no way Katniss-in-the-casual-clothes can be in D2/D13, and she looks way too content to be in the Capitol (compare with how spaced-out she seems as Effie’s dressing her up).